You Are Here: Home » How should my child practice? Keep the piano tuned, and in a good working condition. Make the piano a center of attention – there can be a few pictures of your family or other decorations, but no toys that would create a distraction. If possible, put the piano in an area that your child will see often. Make sure that there is a proper level of lighting. If the bench is not tall enough you can provide a firm pillow, and a small stool on which your child can put their feet to maintain a proper position at the piano – your piano teacher will let you know what you nee he music and assignment books should be visible, organized, and easily accessible to your child. You can use a beautiful basket or organizer of your choice. Keep at least one pen, and two sharp pencils with the piano books – your child will need them for the written exercises, and homework assignments. Schedule practice time daily at least three times per week, according to your schedule. I have students that practice every day, even on the weekend, and other students that do three times a week. I do not require that my students practice every day, however, I have noticed that the ones that do learn about twice as fast, have a better hand technique, and are more motivated than the ones that practice less. 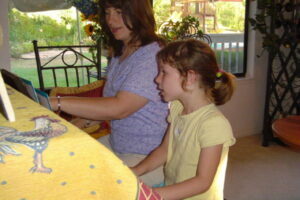 Choose a time when you or another family member will be available to sit with your child. It is best to make piano practice a part of the daily routine. Especially in the beginning, your participation will be crucial because your child will need your guidance to develop a habit of consistent practicing. Have your child ” teach” you. This will give him/her a chance to repeat what they have learned during the lesson. Children LOVE encouraging audience! Also, make sure that your child follows the teacher’s instructions – everything will be written in the student’s assignment book. Explain to your child why practicing is important to them, and to you. 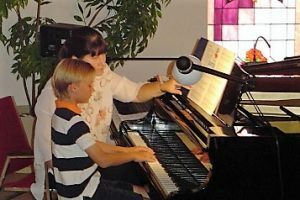 Tell your child that you enjoy listening to their beautiful piano playing, being proud of them, having a great piano recital… Instead of “forcing” the issue, you could offer a reward for the weekend if your child practices a certain number of times during the week… To keep track of practices you could use a chart or stickers. Some parents have shared with me that they tell their children that they can only watch TV, play games, or do whatever they enjoy best after they are done with their piano practice for the day. According to them, this works great. When you show your commitment, your child will follow. Spend time with him/her at the piano on a regular basis- listening, helping, reading the assignment book. If these times together are important to you, practicing will be important to your child. Consistently encourage them to practice on your scheduled days/ times. Bring them regularly to their piano lessons. Try to keep rescheduling to a minimum, and mostly for health-related reasons. Give your child every opportunity to perform. 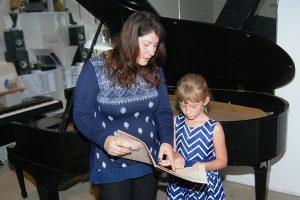 Make sure that your child takes advantage of every opportunity to perform at piano recitals, talent shows at school, even at home for visiting family members. Show an appreciation of their achievements. Children love attention, and performing encourages them to practice, and get better. On a funny note: a few of my students’ parents shared with me that on several occasions their children spontaneously sat and played some of their pieces at music stores, at school, even at COSTCO, and were very encouraged by the people that gathered around to listen to them, and praised their performances. All parents want their children to progress and succeed in every area of their life. I really hope that learning how to play the piano will be one of them and that your child will enjoy music for life.